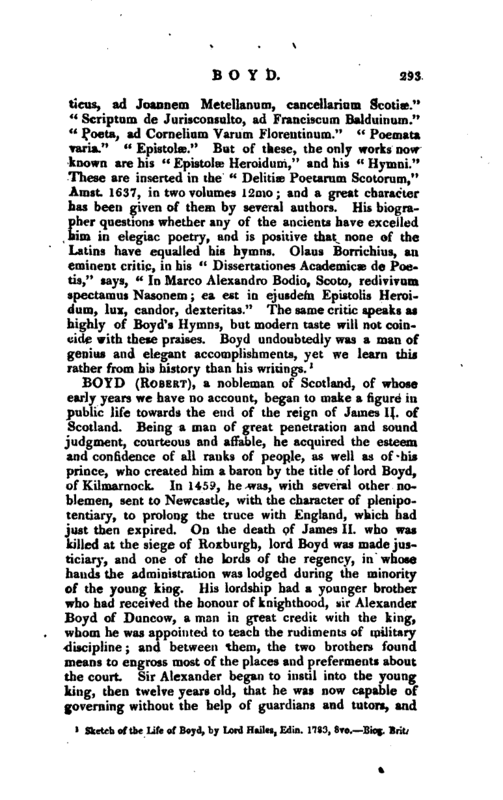 , a Scotch writer of considerable reputation in the sixteenth century, the son of Robert Boyd, of Pinkill in Ayrshire, was born Jan. 13, 1562. Having lost his father early, he was educated under the inspection of his uncle, Mr. James Boyd, of Trochrig, who, with the then unpopular title of “Archbishop of Glasgow,” performed the offices of minister of the Barony parish in that city. Young Boyd, in his nature lively and headstrong, soon grew weary of academical discipline, quarreled with his preceptors, renounced his studies, and, eager to become a man of the world, presented himself at court. It is not unlikely that in this scheme ae relied chit fly on the patronage of liobert, fourth lord Boyd, who was probably the cousin-gernran of Boyd’s father. All, however, that we learn of his proficiency at cm:;c is, that he fought one duel, and was engaged in numberless broils. His relations advised him to follow the profession of arms in the Low Countries, for they could not tolerate his impetuous and unruly temper, and perhaps they were little | inclined or little able to support him in a manner of life which had no determined object or aim. Boyd readily consented to become a soldier; but he chose France rather than the Low Countries, for the theatre of his future achievements. He went therefore to Paris, furnished with a small stock of money, all of which he soon lost at dice. This the author of his life ascribes to some secret fate, “occulto veluti fato” but says his more recent biographer, lord Hailes, we may absolve fate, for when the raw and self-sufficient go amongst sharpers, they ought to ascribe their ruin to folly. 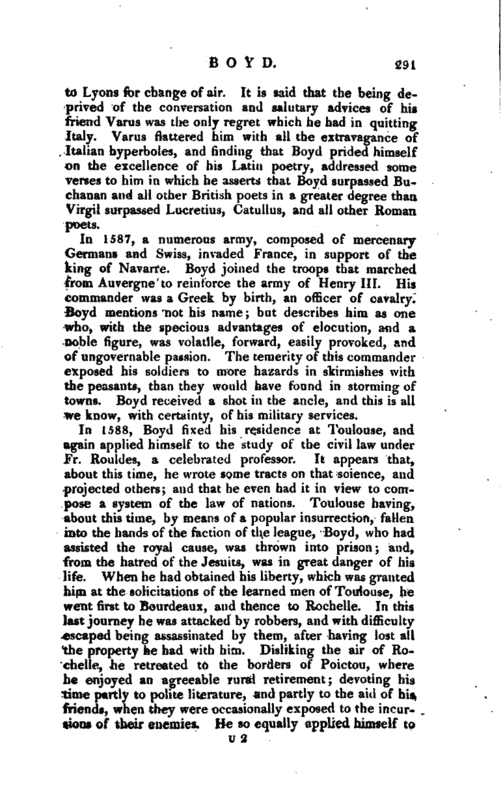 Boyd, observing that young persons of quality, and even military men, were wont to attend academical lectures at Paris, resumed his studies. The teachers to whom he attached himself were, J. Marius d'Amboise, professor of philosophy; J. Passerat, professor of eloquence, not only a scholar, but a wit also, and a poet; and Gilb. Franc. Genebrand, professor of the Hebrew language, who afterwards by his zeal for the French league, tarnished the reputation that he had gained by his literary abilities. Guillonius also is mentioned amongst the professors under whom Boyd studied. He next resolved to apply himself to the civil law, and went to the university of Orleans, where that science was taught by J. Robertas, a man principally known for having dared to become the rival of Cujacius. But he soon quitted Orleans, and went to the university of Bourges. Cujacius, who taught the civil law there, received him with kindness, and possibly, not with the less kindness because his new scholar had quitted Orleans and professor Robertus. 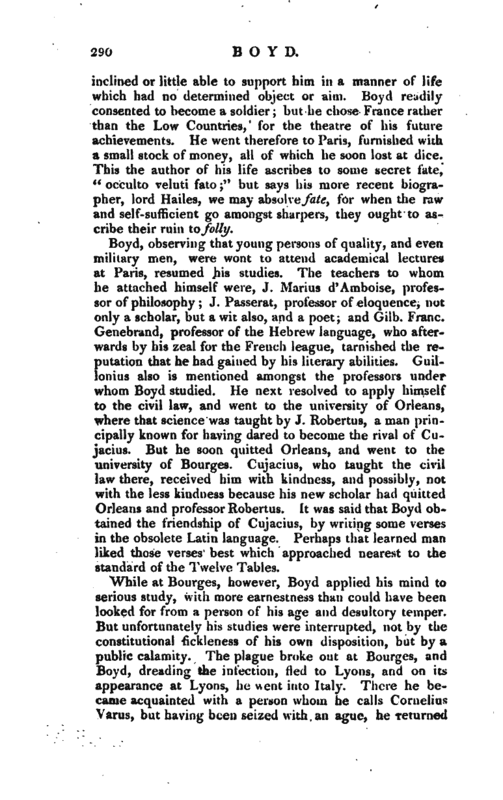 It was said that Boyd obtained the friendship of Cujacius, by writing some verses in the obsolete Latin language. Perhaps that learned man liked those verses best which approached nearest to the standard of the Twelve Tables. While at Bourges, however, Boyd applied his mind to serious study, with more earnestness than could have been looked for from a person of his age and desultory temper. Btrt unfortunately his studies were interrupted, not by the constitutional fickleness of his own disposition, but by a public calamity. The plague broke out at Bourges, and Boyd, dreading the infection, fled to Lyons, and on its appearance at Lyons, he went into Italy. There he became acquainted with a person whom he calls Cornelius Varus, but having been seized with an ague, he returned | to Lyons for change of air. It is said that the being deprived of the conversation and salutary advices of his friend Varus was the only regret which he had in quitting Italy. 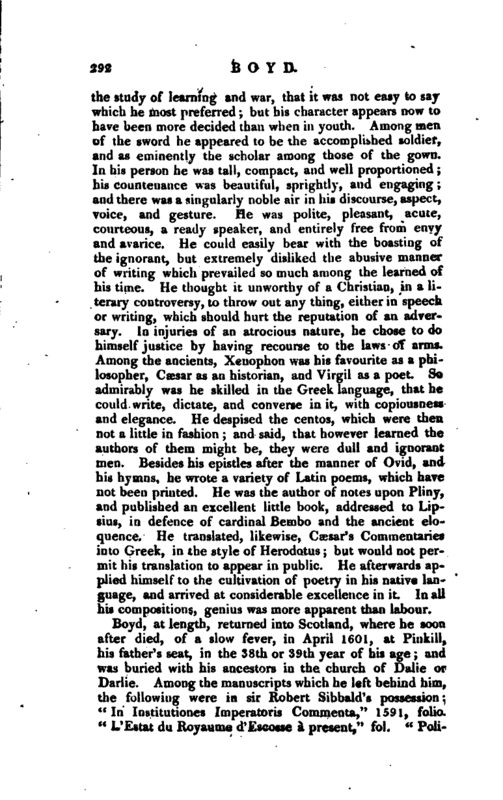 Varus flattered him with all the extravagance of Italian hyperboles, and finding that Boyd prided himself on the excellence of his Latin poetry, addressed some verses to him in which he asserts that Boyd surpassed Buchanan and all other British poets in a greater degree than Virgil surpassed Lucretius, Catullus, and all other Roman poets. In 1587, a numerous army, composed of mercenary Germans and Swiss, invaded France, in support of the king of Navarre. Boyd joined the troops that marched from Auvergne to reinforce the army of Henry III. His commander was a Greek by birth, an officer of cavalry. 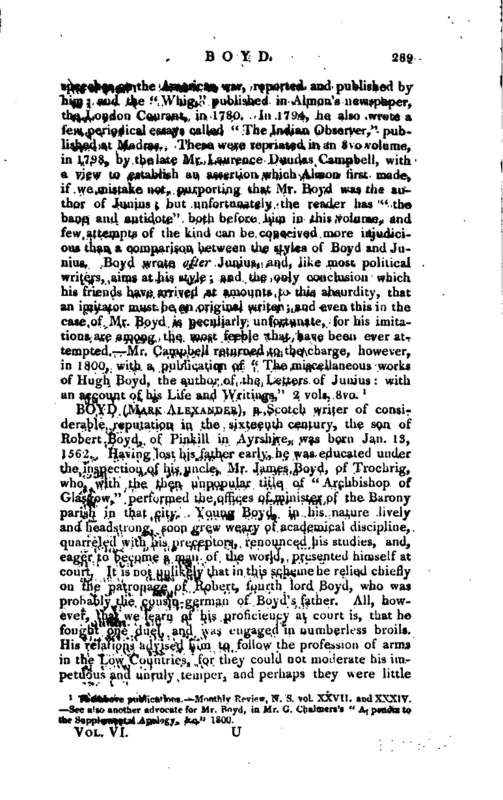 Boyd mentions not his name; but describes him as one who, with the specious advantages of elocution, and a noble figure, was volatile, forward, easily provoked, and of ungovernable passion. The’temerity of this commander exposed his soldiers to more hazards in skirmishes with the peasants, than they would have found in storming of towns. Boyd received a shot in the ancle, and this is all we know, with certainty, of his military services. In 1588, Boyd fixed his residence at Toulouse, and again applied himself to the study of the civil law under Fr. Rouldes, a celebrated professor. It appears that, about this time, he wrote some tracts on that science, and projected others; and that he even had it in view to compose a system of the law of nations. Toulouse having, about this time, by means of a popular insurrection, fallen into the hands of the faction of the league, Boyd, who had assisted the royal cause, was thrown into prison and, from the hatred of the Jesuits, was in great danger of his life. When he had obtained his liberty, which was granted him at the solicitations of the learned men of Toulouse, he went first to Bourdeaux, and thence to Rochelle. In this last journey he was attacked by robbers, and with difficulty escaped being assassinated by them, after having lost all the property he had with him. Disliking the air of Rochelle, he retreated to the borders of Poictou, where he enjoyed an agreeable rural retirement; devoting his time partly to polite literature, and partly to the aid of his friends, when they were occasionally exposed to the incursions of their enemies. He so equally applied himself te | the study of learning and war, that it was not easy to say which he most preferred; but his character appears now to have been more decided than when in youth. Among men of the sword he appeared to be the accomplished soldier, and as eminently the scholar among those of the gown. In his person he was tall, compact, and well proportioned; his countenance was beautiful, sprightly, and engaging; and there was a singularly noble air in his discourse, aspect, voice, aud gesture. He was polite, pleasant, acute, courteous, a ready speaker, and entirely free from envy and avarice. He could easily bear with the boasting of the ignorant, but extremely disliked the abusive manner of writing which prevailed so much among the learned of his time. He thought it unworthy of a Christian, in a literary controversy, to throw out any thing, either in speech or writing, which should hurt the reputation of an adversary. In injuries of an atrocious nature, he chose to do himself justice by having recourse to the laws of arms. Among the ancients, Xenophon was his favourite as a philosopher, Cæsar as an historian, and Virgil as a poet. So admirably was he skilled in the Greek language, that he could write, dictate, and converse in it, with copiousness and elegance. He despised the centos, which were then not a little in fashion; and said, that however learned the authors of them might be, they were dull and ignorant men. Besides his epistles after the manner of Ovid, and his hymns, he wrote a variety of Latin poems, which have not been printed. He was the author of notes upon Pliny, and published an excellent little book, addressed to Lipsius, in defence of cardinal Bembo and the ancient eloquence. He translated, likewise, Cæsar’s Commentaries into Greek, in the style of Herodotus; but would not permit his translation to appear in public. He afterwards applied himself to the cultivation of poetry in his native Ianguage, and arrived at considerable excellence in it. In all his compositions, genius was more apparent than labour. 1 Sketch of the Life of Byd, by Lord Hailes, Edin. 1783, 8vo. Biog. Brit.